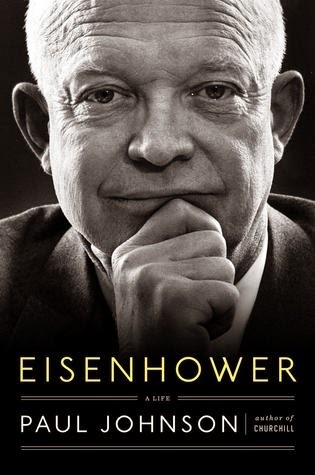 My friend and former editor Frank Wilson offers a good review of Paul Johnson's Eisenhower: A Life for the Philadelphia Inquirer. As recounted in Eisenhower: A Life, a new brief biography by the British writer Paul Johnson, the life of Dwight David Eisenhower was one of steady, uninterrupted success - five-star general, supreme commander of Allied Forces in Europe during World War II, 34th president of the United States, elected twice, both times by landslides, and still popular when he left office. Heck, just a year before he died, he hit a hole-in-one on the golf course. Yet one feels sad when one finishes Johnson's book. Not for Eisenhower, but for the country he served so well. A joke making the rounds as his presidency neared its end told of the Eisenhower doll: You wound it up and it did nothing for eight years. But we could use plenty of that nothing these days. As Johnson points out, Eisenhower gave America nearly "a decade of unexampled prosperity and calm. The country had emerged from the Korean War and the excesses of McCarthyism. Inflation was low. Budgets were in balance or with manageable deficits. The military-industrial complex was kept under control. . . . Thanks to Ike's fiscal restraint, prices remained stable and unemployment only a little more than 4 percent." Note: As for keeping the "military-industrial complex" under control, one should bear in mind that it was the so-called military-industrial complex that has kept us safe all of these years, won the Cold War, put us in space, took us to the depths of the ocean, gave us the Internet and other technological advances, and even killed bin Laden.